The Takamine LTD-2000. This elaborate rosette design depicts the correct positions of the most well-known star patterns in the sky at the stroke of midnight, Jan. 1, 2000 (Orion the Hunter, setting in the southwest and Ursa Major's 'big dipper', rising in the northeast). A celebratory meteor careens across the sky. 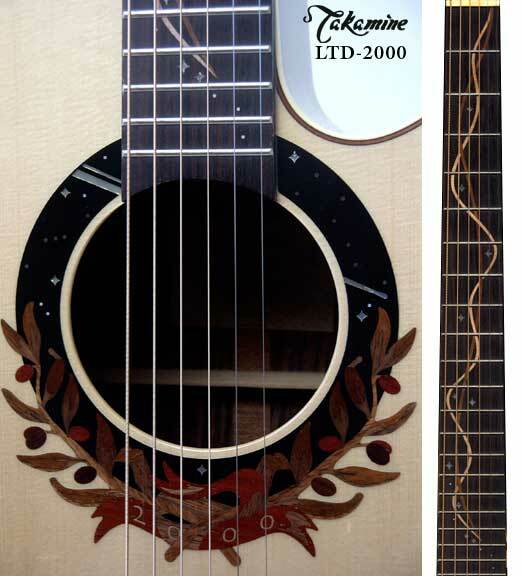 Rounding the base of the rosette, and spreading out onto the guitar top are olive branches, a universal offering of peace, wrapped with a '2000' ribbon. The fingerboard continues this theme with stars entwined in orbital paths, which run through the entire neck and end on the top of the headstock face. This inlay motif used acrylic mirror for the stars and meteor, along with several exotic woods.